Muskegon, Michigan, USA...Mounting structures play a key role in the performance of slewing ring bearings and, like the bearings, should be manufactured to precise specifications. In order to achieve full performance from a properly sized bearing, it's critical to mount it on a flat, rigid surface with the appropriate deflection and fastening strength. 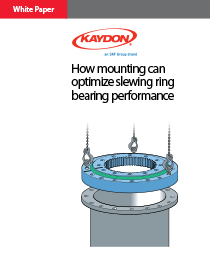 The latest white paper from Kaydon Bearings describes how to select the right bearing; the importance of mounting structure rigidity, deflection and flatness; and the best way to fasten a slewing bearing.